Cure leaf, Potent cancer warrior, Sweet neem, Indian bay and Vitamins powerhouse are some of the celebrated names of Curry leaf, the much treasured and relished aroma provider of Indian soups and curries. Owning a similar appearance to bay leaves, these aromatic leaves hold a distinct flavor contributed by caryophyllene and 3-carene. Curry leaf essential oil is extracted from curry leaves by steam distillation method. Curry leaf tree is an easy to cultivate herb and is indigenous to India and Sri Lanka, the countries of rich cultural heritage. Every part of this tree including its leaves, berries and flowers have enormous medicinal values and the best part is that it is easily affordable to poor people as well. Ayurveda calls this tree as Girinimba or Krishnanimba, named after Lord Krishna, the God of ultimate protection. This ancient art of holistic healing has used Curry leaves and its essential oil in various Ayurvedic preparations for the treatment of diabetes, eye diseases, liver problems, diarrhea, high cholesterol, hair fall, gastrointestinal problems, skin pigmentation and oral disorders. Curry leaves have its name carved in the Tamil literature dating back to 4th century AD for its abundant culinary benefits. Derived from the Tamil word Kari meaning spicy sauce, curry leaves are being clad by numerous vernacular names such as Kariveppilai in Tamil, Kariveppu in Malayalam, Meetha Neem or Karipatta in Hindi, Karibevu in Kannada, Karepeku in Telugu, Folhas de caril in Portuguese, Listya karri in Russian, Fogli di cari in Italian, Hoias de curry in Spanish and Curryblatter in German. Beautifying the backyard of every home in the Indian subcontinent, Curry leaf tree has a strong precedence in the Indian folklore medicine. The leaves are widely used for its digestive properties in numerous Indian cuisines and have been used in Ayurvedic healing as a natural tonic for an extensive range of ill-health conditions. Curry leaves are used in alternative medicinal practices like Ayurveda, Unani, Siddha and the Traditional Chinese medicine for treating diarrhea, vomiting and to endorse the appetite. These leaves are known to possess anti-diabetic properties and is a popular natural aid for controlling diabetes. The paste extracted from the ground leaves are applied on wounds, eruptions, bruises, burns, acne and to treat other skin disorders. Certain Ayurvedic remedies include the roots of Curry leaf tree as an aid to relieve pain associated with kidneys. It also assists in treating inflammation, itching, anemia and other blood disorders. Known for its astringent properties, the fruits of the Curry leaf tree are found to be nutritional and beneficial in the mythological medicines of ancient India and China. The branches of the Curry leaf tree are used since primordial times vastly in the field of oral care. It was used as a datun (natural brush) for cleaning the teeth and strengthening the gums by building a protective shield to battle against the harmful microbes. Rich in carbazole alkaloids, Curry leaf oil constitutes of α-pinene, sabinene , caryophyllene, β-pinene , terpinen-4-ol, γ-terpinene , limonene ,α-terpinene, (E)-nerolidol, α-humulene, α-thujene ,β-elemene ,β-selinene , b-gurjunene, b-bisabolene, trans beta ocimene, b-cardinene, a-selinene and myrcene. This oil serves as a rich nutritional source of carbohydrates, fibers, minerals, proteins, Vitamins A, B, B2, E & C, calcium, phosphorous, iron, magnesium, oxalic acid and nicotinic acids with zero fats. Curry leaf oil is used in promoting the health of humanity with its antioxidant, anti-diabetic, anti-inflammatory, anti-carcinogenic, stimulant, anti-dysenteric, stomachic, carminative, antiemetic, purgative, appetizer, analgesic, detoxifier, diuretic, anti-aging, hepatoprotective, antimicrobial, aphrodisiac, depurative, revitalizing, insecticidal, fungicidal, anti-hypercholesterolemic, lipolytic and deodorant properties. Ayurveda is the ancient science of holistic healing, where ‘Ayur’ means life and ‘Veda’ means knowledge. Being the oldest of all remedial systems in the world, Ayurveda is the mother of all healing methodologies on earth and is the pioneer system for many healing sciences including Siddha, Unani, Chiropractic, Acupressure, Homeopathy and the Traditional Chinese Medicine. Health according to Ayurveda is a three-tier structure comprising of the perfect balance between the body, mind and spirit. This natural science states that wellness and illness depends solely on the perfect rhythm with nature. It also says that everything on earth is a part of nature and is made up the five elements of nature. They are earth, water, fire, space and air. Among these elements earth constructs the physical body (bones and muscles), water runs in the form of blood and other fluids in the body, air aids in breathing, agni or fire is the heat energy created in the body for carrying out the functions of metabolism, absorption and body temperature and space is the spirit that lives in. Ayurveda trusts that every individual is made with a unique combination of these five elements in the form of biological energies known as doshas. These energies put together is the individual constitution or the physical, mental and spiritual make up of a person. Every human being has a predominance of any one of these doshas and this predominance determines their unique personality, character and behavioral attributes. Illness according to Ayurveda is an opportunity to trace out that there is something out of balance in the body due to the imbalance of these three doshas. To treat these imbalances, which are mostly the root cause of a sickness, Ayurvedic system prescribes natural medications like herbs, physical exercises, essential oils, Ayurvedic routine, healthy lifestyle, meditation, prayers, and yoga that suit the individual constitution. 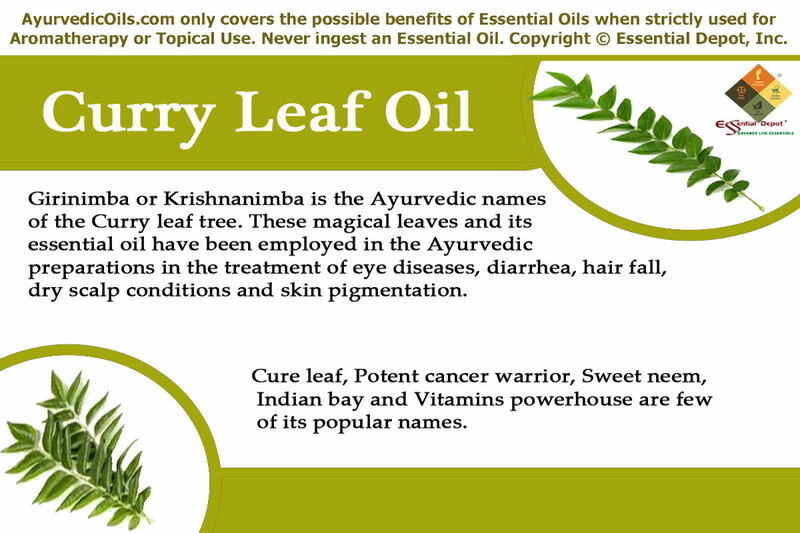 Curry leaf oil has the power to pacify aggravated kapha and vata doshas and increase pitta dosha. With such well-built healing values, Ayurveda prescribes Curry leaf oil as an aid to assist every human being with healthy hair, bright eyesight, strong teeth and gums, glowing skin, actively functioning liver, smooth digestive system, cholesterol and diabetes-free system. Healthy, long, strong and lustrous hair is the dream of many. Here comes the natural wonder to give life to your dreams about your hair and would you believe if I say that the wonder is nothing but the most affordable Curry leaf oil? Yes! A balanced diet with equal proportion of vitamins, minerals, iron and other nutrients is required to maintain a healthy hair. Rich in minerals, iron, Vitamins A, B, C & E, Curry leaves and its essential oil have been used both internally and externally in Ayurveda since ages for hair care. As a rich source of natural antioxidants, Curry leaf oil helps in contracting the muscles and tissues, thus strengthening the roots of the hair and preventing hair fall. The healthy nutrients in this oil promotes natural hair growth and effectively works on the real pigmentation of the individual’s physique and helps in bringing back the original color of the hair. This attribute of Curry leaf oil makes it a wonderful natural aid for premature graying of hair and skin pigmentation problems, where the skin loses its natural pigmentation and white patches start spreading all over the body. A renowned article by the members of the Spices Board Team states that curry leaves have done miracle in the life of those affected by skin pigmentation problems. All you need to do is to add 5 drops of Curry leaf oil in 2.5 ml of coconut oil and massage it gently on the scalp and let it for 1 hour. After this soothing massage wash your hair with natural hair cleansers like Shikakai or herbal shampoos for startling results. For treating skin pigmentation, add 2 drops of Curry leaf oil in 1 ml of olive oil and apply it on the affected areas in a relaxing manner. Use mild soaps on the skin after this massage. Vitamin A is all that comes to our mind, the moment we think about ways to improve our eyesight and protect our eyes from the onset of some common diseases that come along with aging. 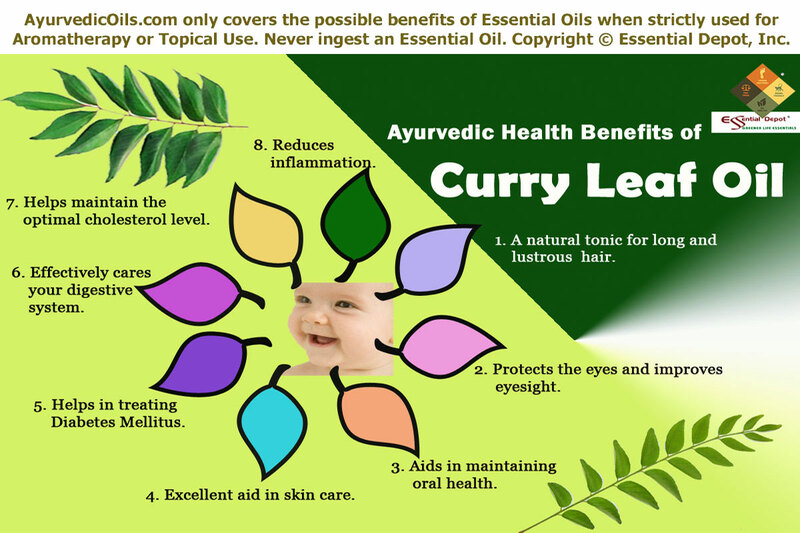 As a rich source of Vitamin A, Curry leaf oil provides the necessary compounds required by the retina of the eye in the formation of the light absorbing molecule called rhodopsin, which aids in good vision. Curry leaves not only help in brightening the vision of the eyes but also assists in delaying the onset of cataract if utilized regularly. You can add 1 drop of Curry leaf oil in steam inhalation or in warm water for washing your face. The best ways to benefit your vision is to use fresh Curry leaves in your diet and adding 1 to 2 drops of Curry leaf oil in almond oil for massaging your face. Gum problems, toothache and bad breath are often the most annoying health conditions. It has been a practice in India since the ancient times to chew Curry leaves daily to maintain good oral health. The essential oil extracted from these leaves are rich in vitamin C, calcium, folic acid and zinc. Adding 2 drops of this oil in a cup of warm water and using it as a gargle aids in strengthening the teeth and gums and gives a long lasting freshness in your breath. Moreover the antimicrobial, antibacterial and antifungal attributes of this oil helps in refreshing the breath thus curing halitosis as well. It is for this great reason; the primeval Indians used the branches of the Curry leaf tree to clean their teeth. A recent study on the role of herbal products for oral care states that chewing Curry leaves or gargling with its essential oil stimulates the process of salivation that in turn increases the salivary PH value which plays an important role in maintaining the oral health and promoting the dental remineralization apart from protecting against various other oral health issues such as bad breath, advent of tooth decay due to harmful bacteria etc. Skin is the largest organ of the human body and most often your skin health reflects the healthiness of your entire system. Today’s contemporary living forces most of us to encounter numerous dermatological problems due to the close contact with harmful chemicals in various forms ranging from cosmetics, hair care, skin care and personal hygiene products that we use every day. Curry Leaf oil serves as a natural antimicrobial and antioxidant agent that aids in protecting the skin from tanning with its rich nutrient values. Massaging your skin with 5 drops of Curry leaf oil blended with 2.5 ml of Jojoba oil effectively helps in keeping the connective tissues intact thus helping in reducing wrinkles and relieving from other signs of aging. You can also add 2 drops of Curry leaf oil in your regular skin care cream or lotion and apply it gently on the affected area for arresting the spread of infectious micro-organisms like bacteria, virus and fungi that often remains as the cause of concern for various skin problems including pimples, athlete’s foot, ringworm, itches, acne, boils and septic of wounds and burns. The antimicrobial property of this oil assists in curbing the growth of microbes causing skin problems and infections and this powerful oil is used in the manufacturing of toiletries and ointments and skin care creams. This oil has the power to treat poisonous insect bites also. Diabetes mellitus is the most common health condition among the numerous hereditary diseases that affect human beings. It is one of the most hazardous ailments for it is always associated with plenty of other factors that can make you completely wreck-down if not kept under control. Ayurvedic healing strongly prescribes the use of Curry leaf and its essential oil for treating diabetes, as these magical leaves have hypoglycemic values. Numerous research studies by medical practitioners and scholars state that curry leaf oil has the potential of slowing down the rate of breaking down of start into glucose which results in lower level of glucose being dispersed in the bloodstream. Ensure that you go on for a natural Ayurvedic massaging twice a week with 6 drops of Curry leaf oil mixed with 3 to 4 ml of sesame oil, followed by a warm bath where 2 drops of this oil is diluted in the bathing water as well. The remedial properties of this oil penetrate through the skin and enter the blood stream where it fights against diabetes mellitus by controlling the blood glucose levels in the body. Curry leaf oil has a handful of remedial benefits including stimulant, appetizer, anti-dysenteric, stomachic, carminative and antiemetic. Being a natural stimulant, it enhances the appetite and promotes the secretion of digestive enzymes, thus aiding in proper digestion and complete absorption of the nutrients after every meal. Curry leaf oil serves as an excellent purgative to regularize your bowel movements. It also helps in alleviating other digestive disorders such as diarrhea, vomiting, nausea due to indigestion, constipation, piles etc. Moreover, it acts as an efficient antimicrobial and antifungal agent to set your intestines free from harmful microbes. This is the major reason for using Curry leaves in food preparation. To help with digestive disorders, you can massage your tummy and abdomen with 4 drops of Curry leaf oil mixed with 2 ml of sesame oil or add 2 drops of this oil in your vaporizer or diffuser. You can also go for a warm bath diluted with 3 drops of Curry leaf oil to relieve from stomach upset, indigestion, irregular bowel movements and loss of appetite. Curry leaf oil is rich in carbazole alkaloids (antioxidant), which helps in aiding the metabolism of fats and fatty acids in the body, thus helping in reducing and eliminating the bad cholesterol in the system. This potential of Curry leaf oil has significant impact in the treatment of obesity and high-cholesterol levels. Massage your system with 6 drops of Curry leaf oil with 3 ml of warm coconut oil and inhale the remedial aroma of Curry leaf oil by adding 2 drops of this oil in your burner or aromatic candles for maintaining the proper level of HDL (good cholesterol) in your system. When inhaled, the aromatic molecules of this oil passes the nasal passages and reach the limbic system, which is the chief control center of the brain and it passes appropriate signals and commands to various organs for active functioning. As a natural detoxifier and depurative, Curry leaf oil helps in excreting the harmful toxins from the body and purifies the blood. It also acts as a diuretic and eases the quantity and frequency of urinating. By this way, it leaves less pressure on the kidneys and protects the liver by aiding it to encounter with less amount of toxic substances. All these medicinal values make Curry leaf oil as a superior natural remedy for reducing inflammatory conditions caused due to water retention and deposits of toxins, excess salt and uric acid. Mix 2 drops of Curry leaf oil with 1 ml of olive oil and massage it firmly on the painful or inflamed parts for quick relief. You can also add 3 to 4 drops of this oil in hot compress for effective results. Due to its richness in vitamin A and calcium, Curry leaf oil is used in strengthening the bones and hence it is highly recommended for women who suffer from osteoporosis and calcium deficiency. It is also a great aid in recovering from the aftershocks of radiotherapy and chemotherapy treatments of cancer. With its disinfectant and antimicrobial properties, Curry leaf oil is also used in the manufacturing of soaps, insecticides and mosquito repellents. This information is only for educational purposes and is not meant to substitute any professional medical advice or prescribed medication. Do not use essential oils internally and always use it topically in a diluted form only, as pure and organic essential oils are highly concentrated extracts from plants. It is advisable to consult your Ayurvedic expert before making the right choice of essential oils that are suitable for your unique state of health and individual constitution. Essential Oils from the Leaves of Murraya Koenigii (spreng. ), Murraya Exotica (linn.) And Murraya Exotica Var. Ovatifoliolata by A. R.; Simonsen, J. L.
Phytochemical diversity of Murraya koenigii from Western Himalaya published in pubmed. A 2012 research article on the Estimation of salivary and tongue coating pH on chewing household herbal leaves: A randomized controlled trial published in PubMed. A 2004 article on ‘The traditional diabetes remedy offers hope’ published in The Times of India. This entry was posted in Essential Oils - Learn About and Purchase and tagged Ayurveda for skin care, Ayurvedic health benefits of Curry leaf oil, Ayurvedic oils for aging symptoms, Ayurvedic oils for diabetes mellitus, Ayurvedic oils for digestive disorders, Ayurvedic oils for hair growth, Ayurvedic oils for inflammation, Ayurvedic oils for liver, Ayurvedic oils for long hair, Ayurvedic oils for lustrous hair, Ayurvedic oils for oral problems, Ayurvedic oils for weight loss, Ayurvedic remedies for cholesterol control, Ayurvedic remedies for diabetes, Chemical constituents of Curry leaf oil, Curry leaf in Ayurveda, Essential oils for eye problems, Health benefits of curry leaf oil, Murraya koenigii, Oils for hair fall control, Oils for skin pigmentation, Therapeutic properties of Curry leaf oil by AyurvedicOils. Bookmark the permalink.